A man was arrested in Shirlington over the weekend after allegedly masturbating in public. INDECENT EXPOSURE, 2019-02020155, 4200 block of Campbell Avenue. At approximately 2:10 p.m. on February 2, police were dispatched to the report of an exposure. Upon arrival, it was determined that the victim observed the male suspect allegedly touching himself inappropriately. Arriving officers located the suspect and observed the suspect continue to touch himself inappropriately and took him into custody without incident. Michael Scott, 55, of No Fixed Address, was arrested and charged with Public Masturbation. Below are the rest of the highlights from this week’s crime report, including some we’ve already reported. ROBBERY, 2019-02040233, 800 block of S. Frederick Street. At approximately 8:43 p.m. on February 4, police were dispatched to the report of an assault with injury. Upon arrival, it was determined that at approximately 8:00 p.m., the victim was walking in the area when he noticed the two male suspects walking behind him. Shortly after, the victim was struck from behind, resulting in a laceration. The suspects stole the victim’s personal belongings and fled prior to police arrival. The victim suffered non-life-threatening injuries and was transported to an area hospital for treatment. Suspect One is described as a black male in his early 20’s, approximately 5’8″, average build, with short curly hair, wearing a black jacket with a hood and blue jeans. Suspect Two is described as a black male, approximately 17-18 years old, 5’6″-5’6″, thin build, with short hair that was almost bald, wearing a black jacket with a hood and grey sweatpants. ROBBERY, 2019-02020060, 4300 block of Henderson Road. At approximately 4:50 a.m. on February 2, police were dispatched to the report of an assault just occurred. Upon arrival, it was determined the two victims had been drinking in the laundry room of a residential building when one stepped outside. When he reentered the building, he was followed by three unknown suspects, who assaulted him in the stairwell. The victim was able to free himself and head back to the laundry room where the victims attempted to hold the door shut to prevent the suspects from entering the room. The suspects forced entry into the laundry room, assaulted the victims and stole their personal belongings and an undisclosed amount of cash before fleeing the scene prior to police arrival. The victims suffered minor injuries and were transported to an area hospital for treatment. A resident hearing the commotion opened her apartment door and was pushed by one of the suspects as they fled the scene. She did not require medical treatment. Arriving officers canvased the area and a K9 track was initiated with negative results. The suspects are described three black males, approximately 6’0″, with skinny, slim builds. Two suspects were wearing all black and one suspect was wearing a gray sweatshirt under a black jacket with the hood up. The investigation is ongoing. LARCENY FROM AUTO (series), 2019-02020103, 2300 block of S. Queen Street. At approximately 9:40 a.m. on February 2, police were dispatched to the report of a stolen vehicle. While on scene investigating, officers were approached by multiple victim’s reporting that between approximately 6:00 p.m. on February 1 and 7:30 a.m. on February 2, an unknown suspect gained entry to approximately three, mostly unlocked, vehicles and stole items of value. There is no suspect(s) description. The investigation is ongoing. ATTEMPTED BURGLARY (late), 2019-02030233, 5000 block of Columbia Pike. At approximately 8:00 p.m. on February 3, police were dispatched to the late report of a burglary. Upon arrival, it was determined that between 10:30 a.m. and 11:00 p.m. on February 2, an unknown suspect(s) attempted to gain entry to the victim’s residence. There is no suspect(s) description. The investigation is ongoing. 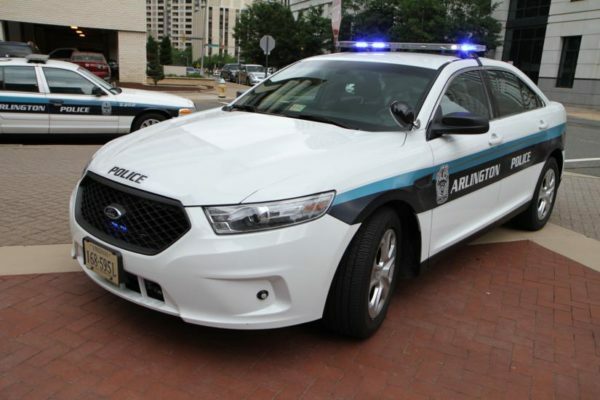 ASSAULT ON LAW ENFORCEMENT, 2019-01300076, 4900 block of Columbia Pike. At approximately 10:18 a.m. on January 30, police were dispatched to the report of a larceny just occurred. Upon arrival, it was determined that the male suspect entered a business, allegedly stole merchandise and fled on foot. A lookout was broadcast and the male suspect was located in the area in possession of the stolen merchandise and taken into custody. While the arresting officer attempted to search the suspect prior to transporting him to booking, the suspect was non-compliant and spit on the officer. Omar Elbasir, 26, of Falls Church, Va., was arrested and charged with Assault and Battery on Police, Obstruction of Justice and Petit Larceny: 3+ Offense.